Above Ground or Below Ground? Located in Springfield MO, TornadoShelter.com began several years ago out of a growing need for quality crafted tornado shelters in the Midwest, following the Joplin Tornado disaster. We believe we've perfected the modern storm shelter with several designs and features that are uniquely ours. As a manufacturer of high grade steel storm safe rooms, we have been called upon by dozens of resellers across the United States to be their "go to" provider for quality storm rooms. As a result, our products are sold not just all through out Missouri, Arkansas, Oklahoma, and Kansas, but throughout the Midwest, the South, the Southeastern US, and the Eastern seaboard as well. In fact, we sell our shelters all over the United States! Tornadoes are certainly not unique to Missouri, so why would our mission be so near-sighted? We wish to provide safe and secure shelters anywhere that they are needed. If that means selling them thru a wholesaler? We're fine with that. If that means selling them under a different name? Sounds good to us. If that means selling them over the internet or direct to the public out of our warehouse? We'd be idiots to say no! While the tornado safe rooms we sell can be found across the United States, our heart is in the Ozarks. We started here. The people of the Springfield Metro have been our engineers, our fabricators, our shop foremen, our accountants. We are intrinsically tied to Springfield Missouri and it's surrounding cities like Nixa, Ozark, Rogersville, Strafford, Willard, Republic, and Battlefield. Situated in the heart of one of the industrial districts in Springfield, and just south of I-44, our warehouse is chock full of the world's best shelters. The Springfield Metro area which includes cities like Branson and Mt Vernon sits at just over 500,000 residents. Good people who have weathered many thunderstorms that have come rumbling through the Ozarks. These people have seen loss of property, damage to their property, and even unwelcome storm related deaths. Because of this, finding a homeowner with a storm shelter in Springfield is not to hard to come by. Springfield is considered by many to be the home of Route 66, the "Mother Road." Many innovations, talent, and ideas have come out of this city and have come thru this city. The people of the Ozarks have a creative and innovative strand of DNA that runs deep in our culture and blood. With the Ozark mountains surrounding us and lakes, rivers, streams, and forests abounding, the Outdoors runs in our blood as well. The people of Springfield and the Ozark region are always cooking up new ways to spend their time outdoors. Boating, fishing, spelunking, hiking, biking, kayaking, floating, zip-lining and more, which is why it is so highly important to our people to be weather warned and prepared when severe weather comes our way. Ever the over-achiever of climactic variation, in 2000, Springfield was rated #1 out of 277 cities as having the most variating weather patterns in the United States. The National Weather Service has put together a great document called the National Hazard Risk Assessment for Greene County which document this information in detail along with plenty of other important facts about our region. Thunderstorms generally follow what is referred to as the I-44 corridor coming Northeast out of Oklahoma to our Southwest. As storms rumble across the dry plains, they begin to hit the Ozarks with our numerous lakes, springs, and bodies of water and pull that moisture up into the far reaches of the atmosphere, breathing new life into the thunderstorm and creating ongoing systems of thunderstorm cells that fire off as the lines move across to the East. Providing our local people with tornado shelters in Springfield MO and the Ozark region is important to us as we see safety as being paramount. But, we also have a desire to see our shelters be utilized anywhere that damaging winds, storms, and tornadic activity occurs. Whether you are looking at buying a storm shelter in Springfield, somewhere else in our region, or clear on the other side of the United States, we are more than happy to assist you in choosing the right shelter for your home and needs. Consider giving us a call today to speak to one of our specialists, and we will help you see how our shelters are better than the competition and worth your investment. ﻿When the storm is knocking at your door, know that your family is protected. While tornadoes have been studied by meteorologists and other scientists for decades, they are still a mystery to us. A tornado by definition is a rotating column of air that extends from a cumuliform cloud to the ground and is generally visible as a funnel. In order for this to occur, there needs to be a violent thunderstorm present. So that begs the question where do thunderstorms come from? Thunderstorms occur when warm moist air is lifted into the atmosphere by convection and collects to form clouds that connect and then release moisture in the form of rain. When these showers build up enough opposite electrical charges, sudden discharges of electric energy occur between clouds or between a cloud and the ground. These discharges are known as lightning. The heat from the lightning superheats the air around it and causes those superheated air particles to slam into the surrounding air, creating a sound wave that we call thunder. These phenomena of lightning and thunder are what differentiate a rain shower from a thunderstorm. Severe thunderstorms and supercell thunderstorms are two kinds of violent thunderstorms that are known to form tornadoes. Severe thunderstorms are stronger than average storms with either wind gusts of 58 mph or greater, hail that is larger than 1 inch in diameter or any thunderstorm that produces a tornado. 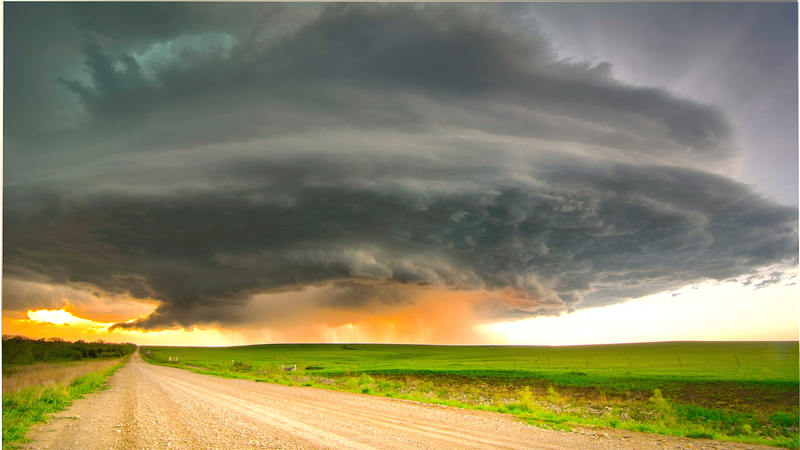 A supercell is a large, single storm that is long lived (over 1 hour), and highly organized. The structure of the supercell involves an updraft (rising column of heated air) and large rotation (called a mesocyclone when visible on radar). Supercells are often responsible for large and violent tornadoes. A tornado forms when a rotating column of air inside a severe thunderstorm or supercell protrudes from a cloud and touches the ground. This often gives way to a visible funnel, though it must touch the ground to be considered a tornado. Tornadoes and their parent thunderstorms often have several typical or classic anatomical features that are easy to spot. When you look at the profile of a supercell, you will usually see a shelf cloud at the base that extends out in the direction the storm is moving. Higher up in the sky you may see mammatus clouds; these look like little cotton balls clumped together and are a sign of turbulence. You will see an area of rain and hail shafts behind the shelf clouds. Behind the precipitation is an area called the rain free base and it is typically here that you will find a tornado if one forms. You may see a wall cloud in this area. A wall cloud is a lowering in the base, you can tell it from other clouds because it is connected to the rain free base while other cloud formations are not. Wall clouds will often rotate which is a sign of imminent tornado formation. The rotating wall cloud will give way to a funnel cloud, which looks like a funnel or cone protruding from the cloud. Once this funnel touches the ground, it is classified as a tornado. There are many other anatomical features of supercells and thunderstorms, but these cover the basics of what to look for. Tornadoes are now classified using the Enhanced Fujita Scale. The category strengths are based on wind speeds, which can be figured looking at damage that they have done or by radar estimates. A tornado can have an Enhanced Fujita (EF) rating of EF0-EF5. Most tornadoes are EF 0 and EF 1 tornadoes. Other kinds of tornadoes that you may hear about include long-track tornadoes and multi-vortex tornadoes. Long-track tornadoes are exactly what they sound like; they are tornadoes that are on the ground continuously for several miles (usually 25+ miles) and a last a long time. Multi-vortex tornadoes are large tornadoes that have multiple smaller vortexes or rotating columns that spin around each other inside the large tornado. These multi-vortex tornadoes are one possible reason that tornadoes seem to “skip” over some structures or areas and leave them untouched while decimating the structure next to it. The majority of tornadoes travel on a southwest to northeast track, though there are areas of the country where this pattern is not as prevalent. 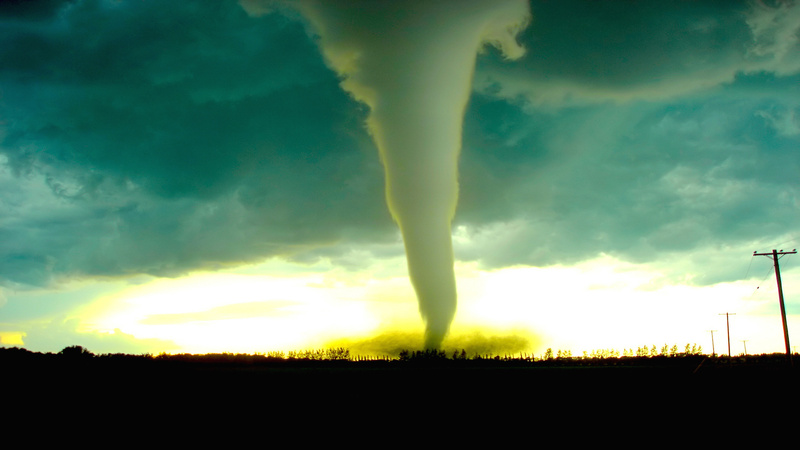 Tornadoes that occur in the Northern Hemisphere rotate in a counterclockwise fashion (though rarely one will rotate clockwise), whereas tornadoes in the Southern Hemisphere will rotate in a clockwise fashion. Tornadoes can dissipate or die just as fast as they form. Just why this occurs is still a mystery to scientists though there are some theories that are generally accepted throughout the weather world. In order for a tornado to dissipate it must lose either its instability or its vorticity (spin). The most commonly seen event that can cause one or both of these events to occur is for the tornado to be hit by cooler outflow air. Outflow is cooled wind that flows out of the precipitation area. This wind can hit the tornado and wrap around it causing it to cool and lose its vorticity or decrease the instability in that part of the storm and cause the tornado to dissipate. Although tornadoes are violent, dangerous and potentially devastating, we are finding out that they may serve a purpose in nature. Nature tends to like to be in a balance within itself. When convective heating occurs and creates a thunderstorm, it also creates instability in the atmosphere. Nature does not like this instability and tries to correct it through means like outflow, precipitation, etc. If the instability is too great, then the fastest and most efficient way to restore stability is to make a tornado to funnel out the extra energy (in much the same way as lightning is the fastest way to eliminate excess electrical charge in the cloud). Just why some storms get to the point where they produce tornadoes to restore stability is not yet known. There are other weather phenomena that mimic tornadoes and are often misclassified by the general public as tornadoes because of the damage they cause. Microbursts are sudden downdrafts (column of sinking air) that blow down and then out from the storm. Microbursts can be very fast moving and cause extensive damage and be very dangerous. They are often thought to be tornadoes by people and it may take a special damage surveying crew to look at the damage pattern and determine if it was a tornado or a microburst. A derecho is a widespread, long lasting. straight line wind storm that often gets misclassified as a tornado because of the amount of damage they cause. After seeing all of this information on tornadoes and severe weather, it is easy to see why a storm shelter is such a necessity! Our Above Ground Tornado and Storm Shelters are the most durable and reliable product on the market today. Fully impact tested at above the industry standards for protection against an F5 tornado, these shelters provide safety during nature's worst moments. Strong, versatile and safe, our Bolt Together Storm Shelters are the strongest shelter we offer due to the additional bracing. We guarantee that our product is stronger than the bolt together units of our competitors. No sacrificing quality here - just as strong! Easily fitting in your garage, our Underground Storm Shelters are the right choice for those looking for below ground protection from nature's fury. Your car can park right over the top. A thick steel door, quality fabrication and welding, means walking across it is just fine! As a unique option in the tornado shelter industry, our cylindrical shelter design gives singles and couples the option for a shelter without the larger footprint that most shelters come with. Just as strong as our larger models, this option is perfect for smaller groups. The newest member of our commanding lineup, the Garage Corner Storm Shelter sits snugly in the corner of your garage with doors that will open inward so that your vehicle can pull in without the bumper hitting the shelter. Same amount of square footage - just as safe! We live in a Do-It-Yourself society in a lot of ways. Our custom kits are perfect for the DIY weekend project! Just as strong and stable as all of our other shelters, this model gives you the ability to turn the wrench rather than pay someone else to do it. With 30+ years in the metal fabricating industry, our team has the unique ability to custom design and create a shelter that meets your needs. With engineering and testing going into every project, you can rest assured that you have invested in a quality product, built to last. So what do you do when you hear your weather radio or tornado sirens go off to warn you of a tornado warning? This will all depend on where you are when this happens. The most common advice you will hear is to get below ground during a tornado. While this is good solid advice, it is not always possible. If you are in a house or small building with a basement then go to the basement. Try to stay away from windows. Hide under the stairway or other sturdy furniture if possible and find something to cover yourself with if you can to protect yourself from any flying debris. If there is a seller available instead of a basement then go to the seller and again take shelter under sturdy furniture if possible. Be very careful if you must go out into the storm to reach a seller and watch for flying debris that may be in the area! You can also take shelter in a storm shelter room or safe room as these are designed to protect you during a direct hit from a tornado. If you are in a house or small building with no available shelter in it, seek shelter in an interior room on the lowest level of the building without windows. This can be a bathroom, center hallway or closet. Take something with you to cover yourself with such as blankets, pillows, etc and crouch down making sure to keep your head covered. If you are in a mobile home when a tornado strikes, do NOT stay there! Mobile homes can be overturned and tossed by strong winds and tornadoes. If there is a common storm shelter or seller in the park go there as quickly as possible and seek shelter, be sure to watch for any flying debris that might be around you. If there is no shelter area available, go outside and run to the nearest ditch, culvert or ravine, lie flat and cover your head with anything that you can. If you are caught in an RV during a tornado do the same thing. RV’s, like mobile homes, are very dangerous to be in during a tornado. Safety advice varies for people caught in their cars during a tornado. Many experts will say that if you can get to a safe place in time then go as quickly and carefully as you can to a shelter. Others will say never try to outrun a tornado no matter what. This is somewhat of a case-by-case basis and would require one to make a quick decision on what to do based on their specific circumstances. If you cannot drive to safety, then abandon your car and once again get into a ditch, culvert or ravine, lay flat and cover your head. Do not seek shelter under a bridge or overpass; wind speeds increase under these and can be much more dangerous and even deadly! Do not try to crawl under your vehicle for safety either, as they are easily overturned and tossed by tornadoes. If you are caught outside during a tornado and do not have a shelter area available to get to, do the same thing as if you were in a car. Find a low spot, away from trees (to avoid crashing limbs), lay down and cover your head with anything you can. What you should do in other public buildings such as churches, hospitals, restaurants, etc will depend on that specific building. Again if there is a basement then go there and take shelter under a sturdy object. Many businesses such as grocery stores and restaurants will use walk-in coolers and kitchen areas without windows or bathrooms as shelters. If you are in a public building during a tornado, listen for any announcements made as to where to go for safety. If there is no designated shelter area then go to the interior of the building on the lowest floor, away from windows and glass doorways and couch down protecting your head. Avoid using elevators in case of power outages. Outside of a car or mobile home, one of the most dangerous places to be is a large public building like a mall. These are dangerous because the roof is usually supported only by exterior walls, making it flimsy and easily collapsible. Again, listen for any announcements on shelter locations; many malls have interior hallways that they use as shelters. If there is no available shelter, go to an interior area on the lowest floor away from windows and glass doors. Get under something sturdy or get in a doorway that is not glass, or against a sturdy wall to help prevent falling debris or a collapsing roof from injuring yourself. If you are in a department store, hide under the cash counter. If you are in a theater, get under the chairs. Once the tornado danger has passed, survey your surroundings. If you are in your home is there any damage inside? Is there any damage outside? If you notice damage to your home, it is advised to shut off power, water, gas and propane tanks if possible to avoid possible fires, explosions, flooding, etc. Is there any damage in your neighborhood? Does anyone need help getting out of their shelter, or medical help? Render whatever aide you can if it is needed until professional help arrives. Watch for things like downed power lines and stay away from them! Is there any gas leak that you can smell, if so call the gas company immediately! If there is a power outage call the power company as soon as possible. Avoid using generators, camp stoves, charcoal-burning grills, or anything else that runs on gas in your house during a power outage as this can cause carbon monoxide poisoning. Do not go into buildings that are damaged or structurally unsound after a tornado. If someone sustains an injury during the event, render whatever aid you are able to. Clean wounds with water or an astringent solution such as peroxide if possible. If a first aid kit is available get it and cover any wounds with clean dressings. If the person has sustained a head, neck or back injury, keep them still and immobilize their head as much as possible until medical personnel arrive. Do whatever you need to attract attention and help to you and your party. When you go to clean up, make sure you wear appropriate attire. You will want sturdy shoes, pants, long sleeves and gloves. You may also need a hard hat depending on the structure you are dealing with. For more information on safety during and after a tornado, contact your local Red Cross or National Weather Service Station. 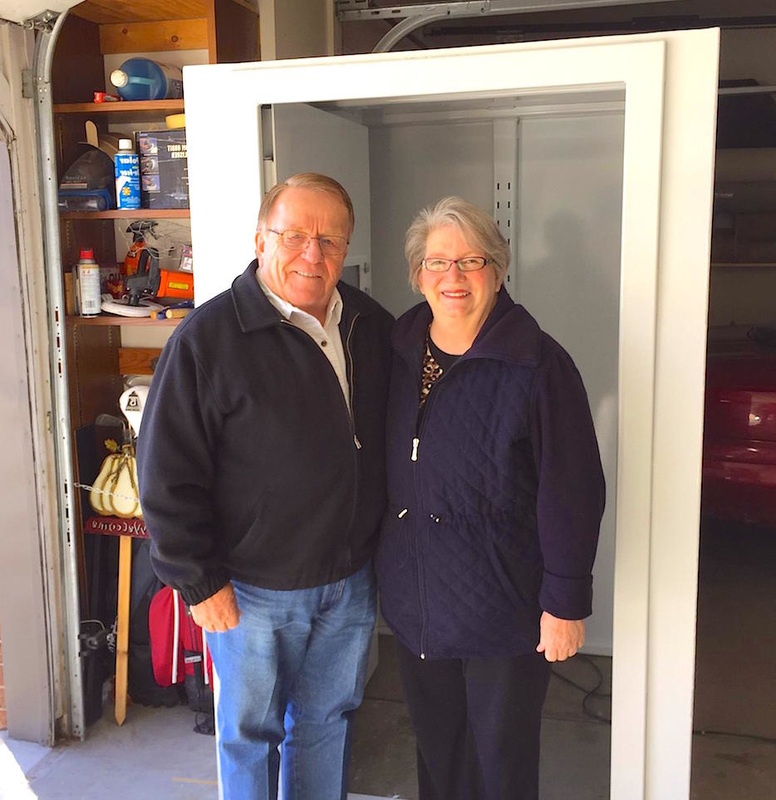 "With the upcoming storm season, the wife and I have been looking at tornado shelters in Springfield Missouri area for a couple of weeks now. We came across these guys, called them and got directions to their showroom. Genuinely nice people, great price, and we're having the work done next week." While most of us will never encounter a tornado directly, most of us will encounter severe weather with high winds and dangerous hail at some point in our lives. These storms can be almost as damaging and dangerous as tornadoes and we all need to take steps to ensure that we, and our families are safe during these or any severe weather event. The biggest key to severe weather and tornado safety is weather awareness. It is important to know if there is a chance for severe weather in your area on a given day. There are many ways to get local weather information now. You can watch the weather forecast on your local news or cable weather channels, read it in your local newspaper, get it online, or download any number of weather apps on your smart phone that have access to weather forecasts nationwide. These forecasts will tell you if any storms and especially severe weather is possible in your area any time soon. If there is a chance for severe weather you will need access to public warning systems that will alert you of impending severe weather. You can get immediate severe weather information from a NOAA weather radio (a special radio programmed to alert you to weather emergencies and other public emergencies), by tuning in to local TV stations, local radio, or certain weather or news apps on your smart phone that provide you with text message alerts. Another very important step in weather safety is to have a severe weather emergency plan in place. This plan should include things such as a safe place to take shelter during severe weather, supplies in case of power outage or property damage, emergency first aid kit, food and water for you, your family and any pets that you have. Your shelter should be a place that is easily accessible by everyone in your family, and be large enough to comfortably hold everyone and any pets for a few hours should you have to stay there for an extended period of time. Underground shelters have generally been deemed the safest shelters for tornadoes, but there are many above ground shelters available now that are specifically built to withstand the strongest winds and violent tornadoes. Check out the large variety of shelters that we offer by clicking on Storm Shelters. Your emergency preparation kit should consist of many items including a first aid kit, food, water, utensils, a can opener, tools, blankets, whistle, flashlight, radio and batteries, and plastic containers for sanitation purposes. You can purchase a premade first aid kit or make your own in a box with bandages of varying sizes, scissors, antiseptic solutions like peroxide or rubbing alcohol, sports wraps, and a bottle of water to clean wounds. You may add more to your kit if you wish, but this will cover most of your basic first aid needs. It is also a good idea to have any regular medications that you take (such as diabetes or heart medications, etc) readily available to take to your shelter with you. You will need at least one flashlight and a radio that is hand crank powered or battery powered with extra batteries in case of power outages. Tools that can be useful in your shelter include a hammer, nails, crowbar, shovel and hatchet or axe in case you need to clear debris to get out of your shelter. A general rule of thumb for food and water in emergency planning is to have enough for 3 days for each member of your family and pets. Make sure that your food is nonperishable, such as canned or freeze dried meals. Generally speaking one gallon of water per person, per day is suggested for emergency preparations; the amount of water and food for your pets will depend on the specific animal. Should you live in an area that is prone to flooding or water supply sanitation issues there are many special devices that are available that immediately sanitize water for drinking purposes. These devices allow you to drink water straight from the source without boiling it first and are available wherever camping supplies are sold. Blankets and/or pillows should be available in any shelters that have windows in them. These are used as cover to protect you from any debris that may break through the glass in your shelter. A whistle or other device that can be used to signal for help should be in your shelter in case debris covers your shelter during the storm. If possible, it is also a good idea to have a small folder or box with copies of important documents like your ID, insurance, medical documents, etc. Make sure any large tree limbs are trimmed away from power lines and your roof if possible. Stay away from any downed power lines after a storm, let professionals take care of these! If you see lightning, seek shelter inside. Never take shelter under a tree during a thunderstorm. Remember if you can hear thunder, you are close enough for lightning to strike. Stay away from windows, do not talk on a phone connected to an electrical outlet, shower or bathe during a thunderstorm (people have been indirectly struck by lightning doing all of these things). Stay indoors during hail storms, hail may look like little innocent ice cubes, but it can severely injure you if it strikes you. After all of your planning and preparing is done, make sure that you follow up on it by practicing with your family. Take time to go over your plan periodically. Carry out tornado drills, go through your emergency supplies to make sure everything is there and in working order, and quiz family members on what to do during certain events. This will ensure that you are as ready as you can be for an actual weather emergency. For more information on weather emergency preparedness and awareness you can contact your local Weather Service or Red Cross office.